Author: Maarten Mous. Series edited by: Hans-Jürgen Sasse †, Mauro Tosco. 18 pp. Roman, 354 pp. Alagwa is a West-Rift Southern Cushitic language spoken in the area around the town of Kooloo in the Kondoa district of Tanzania by approximately 10,000 people, who are better known under the Bantu term Wasi or Waasi in Tanzania. Previous linguistic work on the language is scarce. If at all, Alagwa is mostly treated among other languages, e.g. in the context of historical reconstruction. 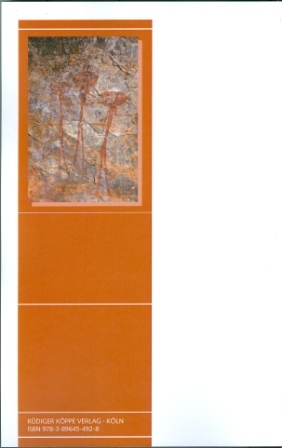 The present monograph is therefore the first comprehensive linguistic description of Alagwa to be published. The book is structured as follows: Following a general introduction to the Alagwa area, the people and the language, chapter 2 deals with phonology, whereas a separate section is devoted to the various reduplication processes. Chapter 3 discusses the nominal modifying suffixes (demonstra­tive, possessive, directional, negative) and presents the pronouns, i.e. the independent counter­parts of the modifying suffixes as well as personal pronouns. Chapter 4 addresses the complex number formation, nominal derivation as well as gender and its interrelatedness with number. Chapters 5 and 6 treat verbal derivation and verbal inflection, respectively. Chapter 7 is dedicated to the inflectional elements termed selectors. Chapter 8 lists the remaining word classes: adjectives, quantifiers, adverbs, ideophones and question words. Chapter 9 deals with syntax. Finally, chap­ters 10 and 11 contain a sample of Alagwa texts as well as a short Alagwa–English lexicon includ­ing an English index. Under the links below you will find the complete texts of the reviews by Andrew Harvey and Roland Kießling. 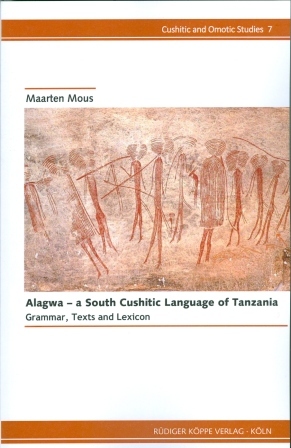 [...] this work-product of several cycles of data collection and years of detailed analysis – represents the very latest in the scholarship of Southern Cushitic, and now makes Alagwa one of the most throroughly described languages of Tanzania. This book will well serve any Cushiticist looking for reliable and well-researched data on Southern Cushitic, as well as any typologist seeking accessible information with lucid explanation. Because of its attention to ethnographic details, the anthropologist will also find this an important resource on a people underrepresented in Western academic literature. The Southern Cushitic languages of Tanzania offer a highly tantalizing field for linguists with a synchronic, diachronic or typological orientation. They form part of a contact zone which involves representatives of all four traditionally recognized language phyla in Africa, i.e. the Tanzanian Rift Valley Area, the outlines of which have only roughly been recognized in Kießling, Mous & Nurse 2008 and whose complexities and historical intertwinings still call for an indepth investigation on the basis of enlarged data sets for all involved languages, especially the ones for which data are scarce, so far e.g. Alagwa. Synchronic descriptions [...] along with diachronic studies [...] have mapped the Southern Cushitic field which deserves to be explored in more detail on all levels. Maarten Mous’s recently published descriptive study of Alagwa is a major advance in this direction. With analytical rigour and considerable detail he provides a first comprehensive synchronic description of Alagwa grammatical structures, based on a sizable corpus of more than 30 texts collected during five fieldwork stays [...] He also succeeds in accurately following up the repercussions of individual phenomena across various structural domains which qualifies for a high degree of density in description and betrays the author’s profound insight into the “spirit” of the Alagwa language.